I’m not gonna lie, I did not expect these to turn out as well as they did. The way the sugars in the root vegetables caramelize when you roast them is delicious. They become entirely different tastes. The harsh bitterness of the radish melts to a golden brown sweetness, the light sweetness of the beet explodes into an almost guilty seeming pleasure. No worries though, guilt is not something you should worry about when eating these beauties. 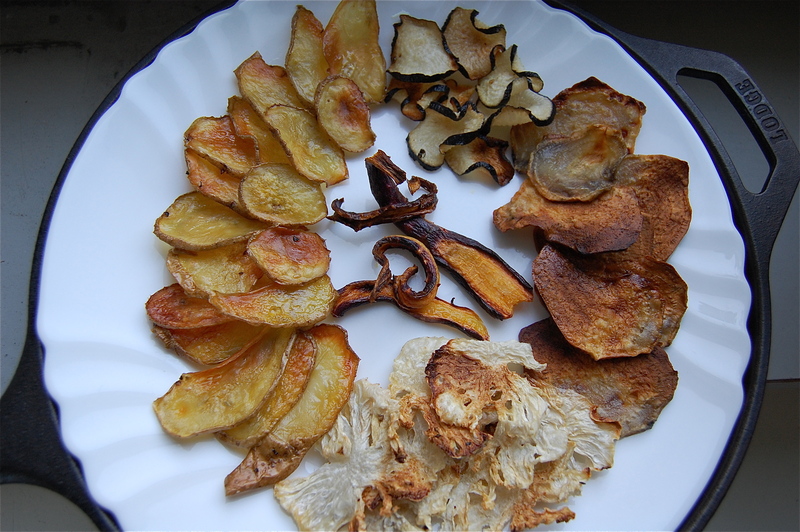 So this idea for roasted root vegetable chips all began with my refrigerator drawer full of slightly dangerous looking vegetables which I had received from my first CSA (community supported agriculture) delivery earlier this month. I was so excited to for the CSA delivery having all these ideas in my head of what it would be like but then once I collected all my strange looking vegetables and got home I realized what am I going to do with these? After ignoring them for too long I decided it was time to bring out the beasts. And little did I know, the little beasts hiding in my refrigerator were beautiful, sweet chips waiting to be roasted to crispy deliciousness. It was a discovery up there with Christopher Columbus’s discovery of America. And the best part is how simple it really is. 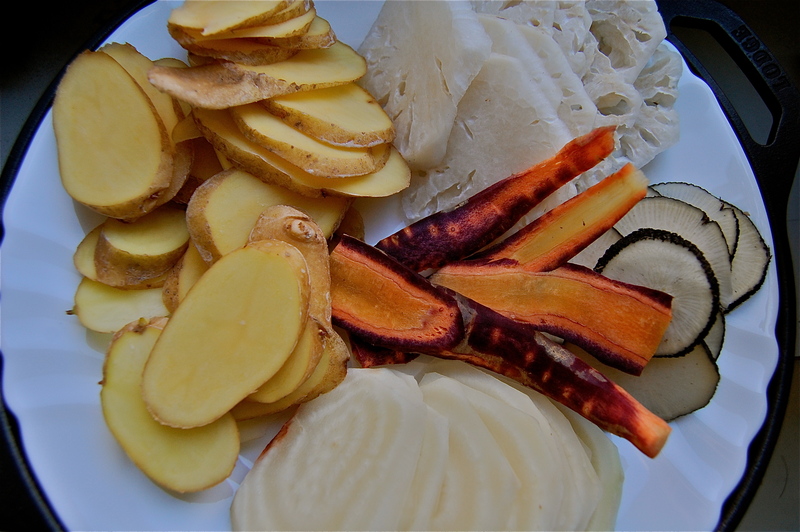 All the ingredients you have in your cupboard all you need is to hit up the closest farmer’s market or co-op and pick out all the ugly looking hairy, strange root vegetables you can find, slice em up thin and crisp them into delicacy. 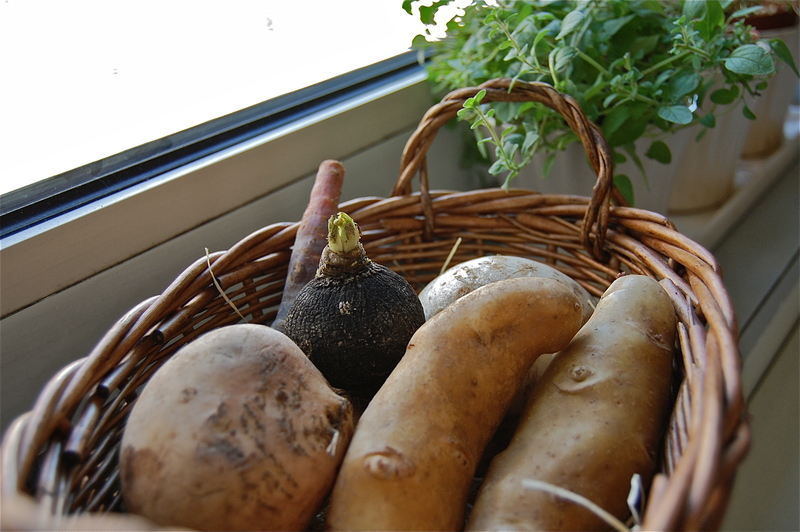 Ok quickly I am going to talk about CSAs and what they are all about for any of you who don’t know (I had never heard about them before just a few months ago!). So a CSA, which again stands for community supported agriculture, is a way for farmers to directly connect to consumers. The consumers pay a one time price, which supports the farm from which the consumer will receive fresh produce from the farm in return for the consumers support. This could be a weekly, or a monthly delivery depending on the agreement between the farmer and the consumer. CSAs are an amazing way to eat locally, seasonally and affordably. I still have a drawer full of vegetables from a delivery in mid January, and since they are all winter vegetables they are holding up beautifully. If you are interested in supporting sustainable living, local farms and experimenting with new, crazy foods I really suggest looking up where there is a CSA around you! Click on this link to look up CSAs across America, I wonder if they have these in other countries?? But back to the recipe! 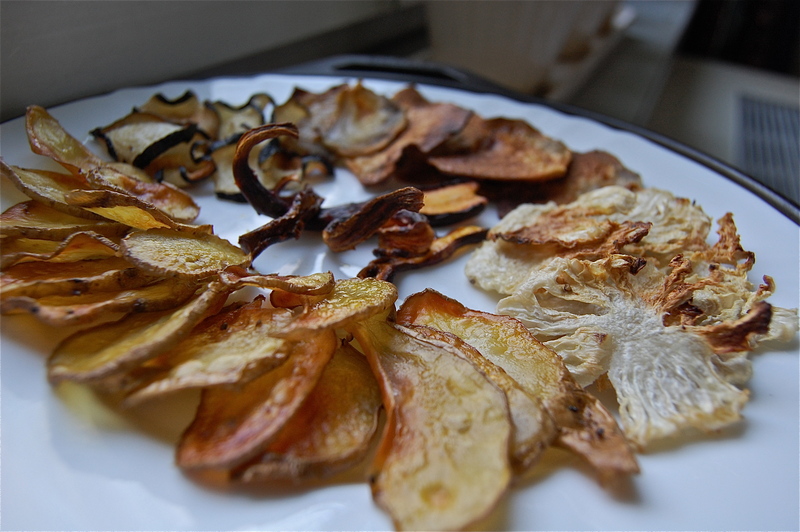 Yummy roasted root veggie crisps just for you! *Ok so you can use a mandolin for this step, yet, due to my recent mandolin injury I still can’t look at the tool without getting queasy. Knifes for me. There were no mandolins used in the making of these chips. These are great by themselves or could be paired with some hummus (see my three homemade hummus recipes here! ), or as a dramatic topping on a squash soup or an open faced sandwich (shout out to all you aspiring great chefs). Well keep exploring and don’t let any of those beasts of root veggies scare you!